The scholars pose with Moey (eighth from right, back row) and fund chairman Datin Noor Azimah Abdul Rahim (fourth left, back row). 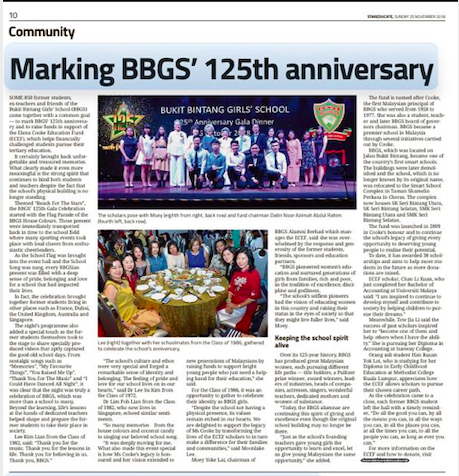 SOME 850 former students, ex-teachers and friends of the Bukit Bintang Girls’ School (BBGS) came together with a common goal — to mark BBGS’ 125th anniversary and to raise funds in support of the Elena Cooke Education Fund (ECEF), which helps financially challenged students pursue their tertiary education. It certainly brought back unforgettable and treasured memories. What clearly made it even more meaningful is the strong spirit that continues to bind both students and teachers despite the fact that the school’s physical building is no longer standing. Themed “Reach For The Stars”, the BBGS’ 125th Gala Celebration started with the Flag Parade of the BBGS House Colours. Those present were immediately transported back in time to the school field where many sporting events took place with loud cheers from enthusiastic cheerleaders. As the School Flag was brought into the event hall and the School Song was sung, every BBGSian present was filled with a deep sense of pride, belonging and love for a school that had impacted their lives. In fact, the celebration brought together former students living in other places such as France, Dubai, the United Kingdom, Australia and Singapore. The night’s programme also added a special touch as the former students themselves took to the stage to share specially produced videos that aptly captured the good old school days. From nostalgic songs such as “Memories”, “My Favourite Things”, “You Raised Me Up”, “Thank You For The Music” and “I Could Have Danced All Night”, it was clear that the night was truly a celebration of BBGS, which was more than a school to many. Beyond the learning, life’s lessons at the hands of dedicated teachers helped shape and prepare the former students to take their place in society. Lee (right) together with her schoolmates from the Class of 1986, gathered to celebrate the schools anniversary. “The school’s culture and ethos were very special and forged a remarkable sense of identity and belonging. The feeling of pride and love for our school lives on in our hearts,” said Dr Lee Su Kim from the Class of 1972. Dr Lim Poh Lian from the Class of 1982, who now lives in Singapore, echoed similar sentiments. “So many memories…from the house colours and coconut candy to singing our beloved school song. “It was deeply moving for me. What also made this event special is how Ms Cooke’s legacy is honoured and her vision extended to new generations of Malaysians by raising funds to support bright young people who just need a helping hand for their education,” she said. For the Class of 1986, it was an opportunity to gather to celebrate their identity as BBGS girls. “Despite the school not having a physical presence, its values remain etched in our hearts. We are delighted to support the legacy of Ms Cooke by transforming the lives of the ECEF scholars to in turn make a difference for their families and communities,” said Moonlake Lee. Moey Yoke Lai, chairman of BBGS Alumni Berhad which manages the ECEF, said she was overwhelmed by the response and generosity of the former students, friends, sponsors and education partners. “BBGS pioneered women’s education and nurtured generations of girls from families, rich and poor, in the tradition of excellence, discipline and godliness. “The school’s selfless pioneers had the vision of educating women in this country and raising their status in the eyes of society so that they might live fuller lives,” said Moey. Over its 125-year history, BBGS has produced great Malaysian women, each pursuing different life paths — title holders, a Pulitzer prize winner, award winners, leaders of industries, heads of companies, actresses, singers, wonderful teachers, dedicated mothers and women of substance. “Today, the BBGS alumnae are continuing this spirit of giving and excellence even though the original school building may no longer be there. “Just as the school’s founding teachers gave young girls the opportunity to learn and excel, let us give young Malaysians the same opportunity,” she added. The fund is named after Cooke, the first Malaysian principal of BBGS who served from 1958 to 1977. She was also a student, teacher and later BBGS board of governors chairman. BBGS became a premier school in Malaysia through several initiatives carried out by Cooke. BBGS, which was located on Jalan Bukit Bintang, became one of the country’s first smart schools. The buildings were later demolished and the school, which is no longer known by its original name, was relocated to the Smart School Complex in Taman Shamelin Perkasa in Cheras. The complex now houses SK Seri Bintang Utara, SK Seri Bintang Selatan, SMK Seri Bintang Utara and SMK Seri Bintang Selatan. The fund was launched in 2009 in Cooke’s honour and to continue the school’s legacy of giving every opportunity to deserving young people to realise their potential. To date, it has awarded 38 scholarships and aims to help more students in the future as more donations are raised. Meanwhile, Tow Jia Li said the success of past scholars inspired her to “become one of them and help others when I have the ability.” She is pursuing her Diploma in Accounting at Sunway College. Orang asli student Han Rusan Yok Lot, who is studying for her Diploma in Early Childhood Education at Methodist College Kuala Lumpur, appreciates how the ECEF allows scholars to pursue their chosen career path. For more information on the ECEF and how to donate, visit http://bbgs.com.my.